Lille is hailed in urban planning circles as the tertiary phoenix that rose from industrial ashes. In significant ways this is true. Indeed, Peter Hall has labelled aspects of this transformation ‘some of the most remarkable in Europe’. [i] The TGV, driverless metro, and the European Capital of Culture 2004 feature prominently in literature about Lille’s ‘renewal’, as do commentaries on its excellent, long-term decision making (given teeth by becoming a metropolis in the 60s) and its Pôles d’Excellence – a series of branded business parks deliberately distributed throughout the metropolis in a polycentric development strategy: However, while most analyses praises the strategic astuteness of these projects, they often conclude that Lille still has ‘a long way to go’ referring to high levels of deprivation, poverty and unemployment in parts of the metropolis. [ii] A recent study identified poverty rates in Roubaix as the worst in France. [iii] From an architectural and urban standpoint, at the heart of this issue lies the competing needs of creating a polarised metropolis to encourage economic development, and an integrated metropolis to facilitate equal opportunity. This essay will offer a critical evalua.tion of four key ‘tertiary’ projects as a way to explore how this dynamic functions across the economic, cultural and residential landscape. These are: Euralille, the Pôle d’Excellence, the 2004 European Capital of Culture, and Gare Saint Sauveur. These track the maturing of Lille’s urban discourse from ‘Major Projects’ to ‘Quality of Life’, offering up some tools for the next steps of the development of the metropolis in the process. The argument goes that the TGV ‘saved’ Lille. At least this was how it was argued by then-mayor Pierre Mauroy, a socialist hero, on his way to successfully bringing it to the centre of town. [iv] Thirty years on, population data supports this claim. Rem Koolhaas was even more explicit stating that the TGV would make Lille important in a ‘completely synthetic way’, by connecting it to a ‘virtual community of 50 million Western Europeans.’[v] Graham and Marvin present Euralille as perhaps Europe’s best example of how the TGV has catalysed adjacent business enclaves. [vi] As history shows us, Euralille did not succeed on the terms it set out, but it is a success as a pole for business. Construction continues and a significant number of businesses have now relocated to the centre of Lille. Today, it is the third-largest business quarter in France. Koolhaas has argued that beyond the TGV, this success rides on the ‘ugliness’ of the urban form that granted the possibility for ‘modernity’ to take root in Lille in all its ‘triumphant nakedness’, sparing the old town from its ravages in the process. [vii] By modernity he actually meant capital, Euralille was intended as a repository for floating capital. Accordingly, as a refined urban set piece Euralille fails: spaces are large and windswept, it is lifeless at night and difficult to navigate. But that wasn’t the point. Here, the only amenity that matters is that which may crystallise global capital: quality infrastructure, fast connections and liberal planning conditions, all on state-owned land. It’s the La Defense of the North. 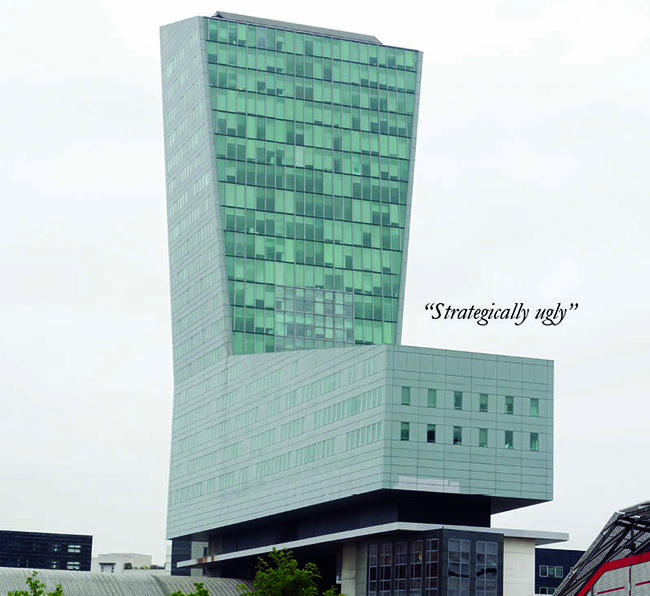 Euralille was strategically ugly. Mauroy has described how his team chose a ‘contemporary project, utilitarian and abrubt’ over a more popular scheme by local architects, one that was more congruent with the existing city fabric. [viii] However, while Euralille was brashly contemporary, it is hardly utilitarian. Euralille’s defence as a ‘modern’ project is code for it being an exercise in property speculation, modern equals neoliberal. The real spectacle was that so much capital landed in one place in a city which had been in slow decline up until this point. It signified Lille being open for business again, bringing with it a new metropolitan confidence. Just like the small town that rejoices in the opening of a McDonalds, celebrating less what it is than what it means, so too has Euralille given Lille a certain confidence knowing that it matters in a national and European sense. Koolhaas argued that criticising the architecture and urban design of Euralille missed the point. Hardly. In the end many speculative, openly capitalistic projects achieve far better results. But he is right in implying that something larger was a stake, and that the project cannot be criticised without a critique of the forces that brought it about in the first place. It did of course ‘save’ Lille. But while Lille is now open for business, this has come at some expense. Just as infrastructure has been fundamental to attracting, retaining and directing enterprise in Lille, so too has culture been fundamental for attracting and retaining both knowledge workers and university students. This is particularly remarkable given Lille’s historical status as a cultural desert during its industrial heyday. The coming of age of Lille’s cultural credentials was its designation as 2004 European Capital of Culture (ECC). With new tertiary business infrastructure now in place, culture became a tool for marketing Lille’s ‘attractiveness’. The Capital of Culture signified the arrival of this city branding on the European stage. The ECC was significant in another way as well. It marked a transformation in Lille’s strategic direction from Grand Projects to Qualiti de Vie, from major projects to quality of life. [ix] This was brought about by a change in Mayors: Martine Aubry replaced Pierre Mauroy (both socialist) in governing the metropolis. While recognising the economic polarisation brought about by business development, she set about using culture and recreation as a way of giving each neighbourhood a ‘Mark’ of recognition, to gain – or regain – self-confidence. [x] Culture was instrumentalised for a social purpose. Consistent with the strategy for the Pôles d’Excellence, the major infrastructure for the Capital of Culturewas constructed in Lille’s most disadvantagedneighbourhoods. The three Maisons Folie thatservedas major cultural nodes were located in Wazemmes,Moulins and Roubaix, the historical centres ofLille’s most underprivileged. However, unlike the Pôles, their scale and implicitly open programminghave allowed for wholesale formal integration withtheir immediate settings. The problematic relationship between the production of immaterial capital (such as ‘culture’) and disadvantaged groups has been set forth by many. [xi] The process is common enough to be paradigmatic. Firstly, artists move to a derelict/dangerous but strategically interesting location for its low rents. Their presence eventually causes the area to become more attractive, changing its perception within the city and raising property values and with them rent. Gentrification ensues. The ultimate winners are property speculators and city brands, the losers ace anyone who rents, often the artists who created the immaterial capital in the first place. The defence Pasquinelli proposes is to ‘make specific urban areas unfriendly to capital colonization’. [xii] Pasquinelli’s critique problematizes urban renewal of the kind undertaken in Lille, both economic and cultural. However, commentary reviewed for this essay focussed exclusively on how far Lille’s cultural scene has come rather than the gentrification that has followed, implying that Roubaix is in no danger of the kind of gentrification found in Paris or London any time soon. [xiii] At least not yet. A recent competition offers a strategic toolkit for integration. Gare Saint Sauveur is a majority housing project in the centre of Lille launched with an international competition in 2013. Previously a goods railway station, this site saw its last commercial use in 2003, symbolically marking the end of Lille as an industrial economy: ‘Infrastructure’ for Lille’s tertiary workforce will now occupy the site, a process commenced with the renovation of two industrial sheds into a bistro and gallery as part of the 2004 European Capital of Culture. Alongside this the program includes a metropolitan-scale library, a primary school, a high school, a culture centre and two recreation centres. The design response uses open space as the mediator not only with the immediate surrounds, but with the wider metropolis. The scale and geometry reflects a spatial hierarchy. Some spaces are intended as metropolitan destinations, others as local amenities, others still as shared private gardens. Gare Saint Sauveur is too recent a project to have yet attracted critical attention, and really it is all just words until it is realised. However, the current scheme features significant similarities to Bo01, the 2001 Swedish housing exhibition in Malmö that sits across the Oresund from the Copenhagen base of Gehl Architects, lead architects for Saint Sauveur. Bo01 has become an export for Malmö, attracting between 10,000 and 12,000 built environment professionals annually. [xv] This is despite the fact that the housing corporation went bankrupt, and Klas Thrun, the masterplanner, was never hired for another commission. In the end the quality was so high it is not repeatable. Further ‘the world’s most ecological district is filled with people with a daily consumption pattern that if shared with the rest of the world would ruin the planet. '[xvi] Bo01 is a shamelessly gentrified urban district however its ocean-front promenade has in fact become a metropolitan attractor during summer, bringing in residents from some of the poorest areas. When it was observed that rocks in the ocean may be a hazard to people swimming, the city removed the rocks. The urgent need for economic development that formed the backdrop of Lille’s tertiary transformation catalysed a certain kind of project. Lille’s five Pôles d’Excellence polarised Lille’s economic landscape and affected a splintering urbanism. [xvii] No doubt these projects have clanged the economic fortunes of the metropolis, but not for all of its inhabitants. With the change in tack from Grands Projects to Qualité de Vie a new paradigm has emerged that has influenced the cultural and residential landscape of the metropolis, demonstrating the significant resources available to urban projects in France. In particular, Gare Saint Sauveur has been imbued with an extraordinary number of mechanisms for social integration, from a library and schools to social housing and recreation facilities. A rigorous public space strategy structures and supports this program. The only question is what it would mean to bring the tools of integration to the Pôles themselves.? As Lille matures as a tertiary city, it must critically engage with the very projects that brought about its revival, to this end, Lille’s cultural and residential projects offer a ready-made catalogue and this might be an obvious place to start. [i] 1 Peter Hall, Good Cities, Better Lives: How Europe Discovered the Lost Art of Urbanism (Oxon: Routledge, 2014), 189. [ii] The narrative is relatively similar between Hall (2014) and Couch, Chris, Charles Fraser and Susan Percy, ed., UrbanRegeneration in Europe (Oxford: Blackwell Science, 2003). [iii] Compas, ‘Premières estimations du taux de pauvreté des plus grandes communes de France’ (Compas, 2012), 2. [iv] Chris Couch, Charles Fraser and Susan Percy, ed., Urban Regeneration in Europe (Oxford: Blackwell Science, 2003), 91. [v] Rem Koolhaas with Bruce Mao and Office for Metropolitan Architecture, S, M, L, XL : small, medium, large, extra-large, ed. Jennifer Sigler (New York: Monacelli Press, 1998), 1156. [vi] Stephen Graham and Simon Marvin, Splintering Urbanism: Networked Infrastructures, Technological Mobilities and the Urban Condition (London: Routeledge, 2001), 369. [vii] Rem Koolhaas et al., Euralille: The Making of a New City Centre (Basel: Birkhäuser, 1995), 190. [viii] Dominique Carré, ed., Euralille, Chronques d’une Métropole en Mutation (Paris: Carré, 2009), 14. [ix] Estienne and Grégoris, ‘Dynamiques Culturelles, Métropolisation et Renouvellement Urbain’ in Didier Paris and Dominique Mons, ed., Lille Métropole: Laboritoire du Renouveau Urbain (Lille: Parenthèses, 2009), 89. [x] Dominique Carré, ed., Euralille, Chronques d’une Métropole en Mutation (Paris: Carré, 2009), 8. [xi] Matteo Pasquinelli, ‘Creative Sabotage in the Factory of Culture: Art, Gentrification and the Metropolis,’ in Pasquinelli, Matteo, Animal spirits : a bestiary of the commons (Rotterdam: NAi Publishers 2008) 128. [xiii] Hall (2014) and Couch, Fraser and Percy (2003) come to similar conclusions. [xiv] Lille Métropole Cammunauté Urbain, Ville de Lille and SPL Euralille, Saint-Sauveur: Cahier des Charges Urbain, Tome 1 (Lille: Lille Métropole Cammunauté Urbain, Ville de Lille and SPL Euralille, 2013), 102. [xv] Ståle Holgersen, “The Rise (and Fall?) of Post-Industrial Malmö: Investigations of city-crisis dialectics” (unpublished PhD diss., Lunds Universitet, 2014), 15. [xvii] Graham and Marvin, Splintering Urbanism.